Once a neglected area on the rooftop of a car park, the urban orchard is now a place to celebrate the importance of growing fresh, healthy food where we live: the perfect spot to eat lunch and meet up with friends. In the garden beds you will find fruit, vegetables, herbs and companion plants. The planter boxes are made from recycled waste from other parts of the building works, the plants are managed organically and will be harvested and planted seasonally. This is the embodiment of sustainable community gardening and is a resource for all. The orchard will provide nutritious and tasty crops throughout the year and you can be involved in community planting, harvesting and education events. 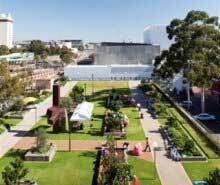 Its also a new destination for events and activities in the Perth Cultural Centre. Visit the urban orchid website via the link below to see whats on and whats growing in the urban orchard! Each quarter the community are invited to get their hands dirty at the Urban Orchard and help to plant next seasons crop, along with celebrity gardener and media personality Josh Byrne and his team. It is a family event for gardeners of all ages. Registrations open a few weeks prior to the event so make sure you are subscribed to our email list for all the up to date information.